While some people swear that Banting has given them a new lease on life, others say it is absolute nonsense. Health24 spoke to someone who says she picked up weight with Banting. Tim Noakes and other professionals respond. Banting vs Heart Foundation Diet – which is cheaper? Despite a lack of any large scientific studies on the safety of Tim Noakes' Banting "lifestyle diet", and even fewer on whether those who follow the low-carbohydrate, high-fat (LCHF) diet can sustain a life devoid of rice, bread and potatoes and keep the weight off once they resume normal eating (that includes all the food groups), the craze still gathers followers every day. Dozens of men and women have lost weight and say they have enjoyed huge health benefits. But as more people try it, it has become clear that it's not a win-win for everyone and some people actually gain weight on the diet. "Please do not be fooled," cautions Annatjie Du Plessis, a type 2 diabetic who takes Metformin tablets twice daily to control her blood sugar levels. Annatjie embarked on the Banting diet around May 2015 and, when she failed to lose weight, contacted our content partner, News24, with her story. "I started the Banting lifestyle because of all the reports and articles on how good it was and all the promotion this lifestyle was getting from the media," she told News24 in an email. She had bought Noakes' book The Real Meal Revolution, started buying Banting food and even signed up for an online LCHF weight-loss course. "I actually was not really that much overweight since I weighed 69kg and am 165cm tall, so I just wanted to be able to eat normal food and not measure and weigh everything every time I eat. "I spent more than R5 000 buying Banting-prescribed foods. Almond flour, coconut flour, coconut oil, psyllium husk, bread mix, muffin mix, macadamia nuts, eggs, bacon, special 'wors', special biltong, real butter, nut oils and many more products. Not one of them is cheap or moderately priced. All the products used for Banting are expensive. "Just to give you an idea, a Banting bread – a small loaf of about 8 slices – costs R50. Xylitol, which is recommended as the sugar replacement is R127 for 500 grams." She said after a few weeks she contacted The Real Meal Revolution via email and complained that she was not losing any weight. "They answered back with a standard email referring me to their website and said I should check the labels of the foods I was eating. "After doing that, I again sent them an email stating that I was doing everything precisely as the book said and was not eating anything not prescribed. I again got the same reply." Desperate to see some progress, Du Plessis went as far as buying an online course, which is based on LCHF dieting principles. "I still did not lose any weight and in fact picked up 4kg." Based on her experience, Du Plessis warns: "Please do not be fooled and believe what you read in the book that is on sale. Also do not buy any courses that are offered." "To gain weight means that she has increased her calorie intake," Prof Tim Noakes told Health24 when we quizzed him on this particular case. "The Banting diet works because in most people who follow it, reducing carbs and increasing fat intake spontaneously reduces calorie intake without producing hunger. In some women this does not occur for reasons that we do not understand. "To overcome this we advise some degree of food restriction – by eating less frequently and by practicing intermittent fasting. The brain controllers that direct calorie consumption need to be re-programmed and this requires active participation by some individuals." Noakes, who in a previous article for Health24 explained that he has a predisposition to develop adult-onset diabetes because he is what is known as “carbohydrate resistant” (CR) and hence “pre-diabetic”, added that the presence of diabetes complicates the issue, especially if insulin is used because it is a fat building hormone. "Those who struggle to lose weight need to be absolutely certain they are not eating more than 25 grams of carbs per day," he said. 25 Grams of carbs is about 1 medium baked potato. Real Meal Revolution Managing Director Jonno Proudfoot told Health24 The Real Meal Revolution book explains that weight management is a complex issue. "There could be a number of reasons why someone is not losing weight. Without a proper medical history, it is not possible or legal to make a diagnosis." Du Plessis also claimed that The Real Meal Revolution "is sort of turning a blind eye to alcohol". "A lot of people follow this diet because they can have a drink. I found that the moment I drink a whiskey, I pick up weight. That is another point the Banting thing is talking rubbish about." Proudfoot pointed out that the book has taken a clear stance on alcohol. "The carbs in some drinks will add up. The low carb spirits do not contain carbs. Whether you decide to drink or not is your decision. It will not help you control your appetite." Noakes added that he is a teetotaller and does not personally promote alcohol consumption. "I normally tell patients that they should remove alcohol from their diets until they are the weight they want to be. Then they can re-introduce alcohol and see what it does. My prediction is that it will usually lead to some weight re-gain." 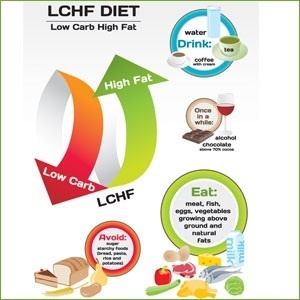 Proudfoot said although there has been no conclusive evidence to support a LCHF diet, there is conclusive evidence that the LCHF/Banting diet reverses all indicators of coronary heart disease, obesity and type 2 diabetes. "For more information, we encourage people to visit www.lchfconvention.com or read Big Fat Surprise (Nina Teicholz) and Good Calories Bad Calories (Gary Taubes) and Real Meal Revolution (but read the back essay instead of just reading the recipes)." About two weeks ago Health24 was contacted by Amy Ryan (not her real name) who happens to be a type 1 diabetic and also takes Metformin, and says she has lost 4kg by drastically reducing her consumption of carbs. But, she adds, she is not following the Banting diet by the book as this would mean she has to eat fewer than 50 grams of carbohydrates per day, and that would be dangerous to her health as it's where ketosis generally kicks in and it could negatively affect her blood glucose control. "I have cut out dairy, sugar, alcohol, preservatives and almost all 'unnatural' carbs." The 26 year old from Cape Town, who is under the care of Health24's Diabetes Expert, Dr Wayne May, an endocrinologist, and a registered dietitian said the only carbohydrates she eats come from vegetables such as sweet potato, butternut, pumpkin, gem squash, peas etc. and from fruit. "I limit my carbohydrate intake to 15 to 30g per meal. I usually take in between 60 and 90g of carbs per day," adding that she may ingest a bit more when doing strenuous exercise. She explains that she has to have some carbohydrate at every meal to reduce the risk of hypoglycaemia. "I have not gone high fat or high protein but rather have kept a normal intake of those two. I do however try to add some healthy fats – such as nuts, seeds, avocado and olive oil – to every meal as this blocks blood glucose spikes." Speaking about her recent visit to the doctor, Amy was advised to add Metformin to her medication because she is quite insulin resistant. "I now take 500mg of Metformin at breakfast and another 500mg at dinner." "I have also tried upping my exercise. So far I have lost 4kg in about 17 days. I have had my cholesterol, blood pressure and kidney functions screened and all results came back normal." She said she also had her lowest HbA1C result, which calculates the amount of sugar attached in the blood over a 90 day period, for this year. A normal person’s HbA1c will usually fall between 5.0 to 6.0. "Mine is now 6.5. Ideally I would like to get it under 6.0. This indicates that my blood glucose control over the last 90 days has been a lot better than before." Read: Can the 'Banting' diet cause diabetes? Health24 Diabetes expert, Dr Wayne May said that patients who fail to lose weight on the Banting diet, do so for two main reasons. "They don’t understand what contains carbs and they think they can eat as much as they want and hence take in too many calories." He said in regard to diet, there are only two components that can be altered, and that's the quality and the quantity of the food. "In regard to weight loss the most important change must be a reduction in quantity (number of calories). In regard to quality, you can reduce the calories with any diet of your choice (low carb, or low fat, or Mediterranean etc. ), and this is based on individual needs." Dr May said although patients don’t have to weigh or measure all their food, they do need to have an idea of what a correct portion looks like. Kerryn Gibson, a qualified paediatrician and sports dietitian in Durban, told Health24 that it is not uncommon to hear of people who have gained weight while following a LCHF, particularly females. "Regardless of what foods one eats, weight loss will always be a question of energy balance. Foods with a high fat content have a high energy density; every gram of fat contributes 9 kilocalories. "Therefore, to ensure a low energy intake overall to facilitate weight loss, one should eliminate energy dense foods. By comparison, every gram of lean protein contributes 4 kilocalories and every gram of carbohydrate contributes 4 kilocalories. "Achieving the correct intake for weight loss will depend on what ratio of protein, carbohydrate and fat one eats. While one does not need to measure and weigh foods, having an appreciation of what nutrient ratio people needs to eat to help them to achieve their goals is important. This is unique for each person, a one size fits all approach does not work." Gibson said prescribed eating plans must allow for flexibility, convenience and ease of implementation in order to ensure compliance. "This will foster better eating habits and overall improved food intake relative to one’s lifestyle." Is the Tim Noakes Diet affecting your hair, skin and nails? DietDoc asks: why are we always chasing quick-fix diets? Too much, too soon, Tim Noakes!